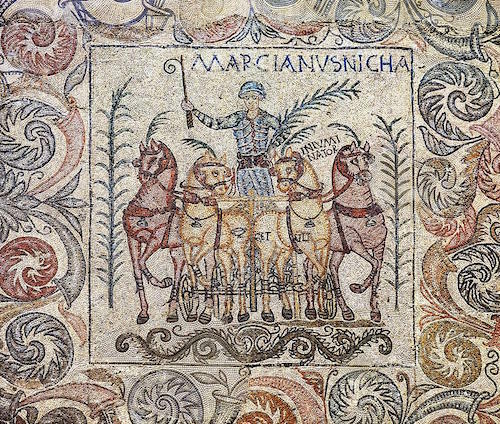 The Roman mosaic below shows a charioteer from each of the four Chariot Factions (meaning teams). 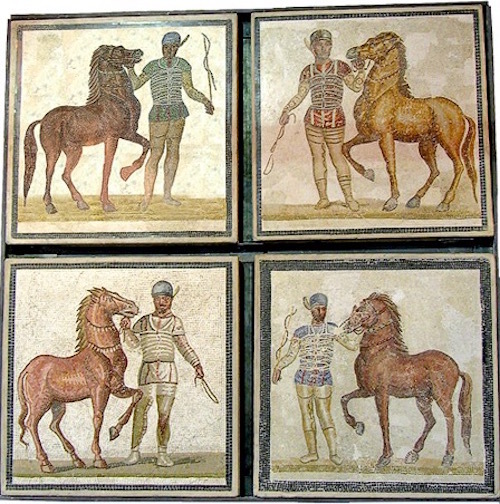 Scorpus (c. 68- c. 94, 95 AD) rode for the Green Faction, first image on left hand side. The 250,000 people who gathered in the Circus Maximus in Rome to watch the chariot races were fanatical fans (from the Latin word fanaticus meaning “mad, enthusiastic, crazy”). They were as devoted to the Red Faction, or the Blue Faction, or the White Faction or the Green Faction as people are today devoted to the Crimsons, the Blues, the Whites or the Greens or any other color of their own favorite teams. We do not know exactly how Scorpus died, but it is obvious he died during a race in the Circus. He was very young, only 26 or 27 years-old. Many of the men who drove the chariots were slaves. Scorpus had probably started racing for his master in his late teens or early twenties but in those short years he had won 2,048 victories and had received the laurel wreath, the symbol of victory many times. This victor, Marcianus Nicha, rode for the Blue Faction. Many times the lead horse became very famous, too. 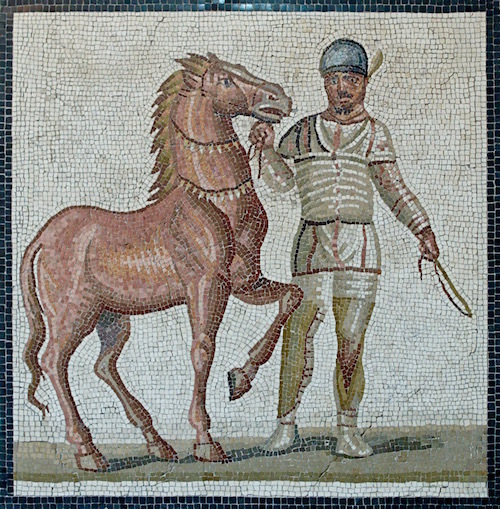 Below, the lead horse (the inside horse) is called “Iniumi nator,” meaning “son of Iniumi.” Scorpus was a Roman hero. 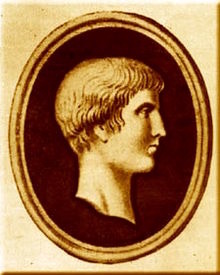 All Rome and its provinces knew Scorpus’ name and his fame. Often at the end of a victorious race, fans threw bags of gold into the arena at his feet. He was paid well for each victory so he lived well. 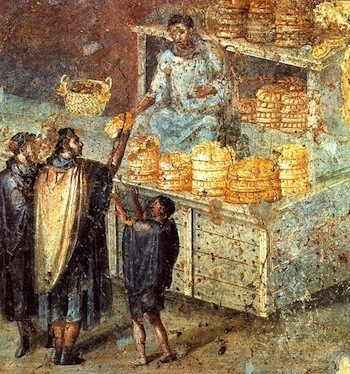 Scorpus had made enough money to buy his freedom and he became a liberti, a freed slave. 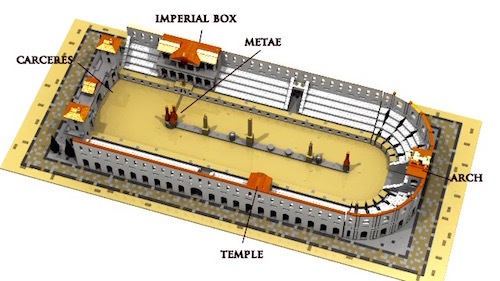 There were numerous crashes during a chariot race in the Circus Maximus. The Romans called these crashes naufragia, meaning “shipwrecks.” The crashes frequently occurred at the turning posts, the metae. The stone plaque below (from c. 70 AD) illustrates a crash at the turning post (metae). Two horses are down; one horse is attempting to run in the wrong direction. A man on the ground is attempting to help the situation. The charioteer has fallen out of his chariot and is on his back. Another man has his hand to his face expressing anguish/shock. If the charioteer could not make the turn properly, he crashed and the horses and drivers behind him could not stop and ran over him, his chariot and horses. CLICK HERE to watch the chariot race/crash scene from Ben Hur. 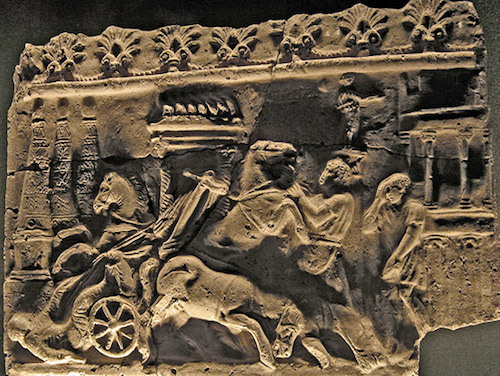 The terra cotta relief below depicts a charioteer driving a quadringa, a 4-horse chariot. Notice part of the body of a fallen driver at the foot of the turning point. Perhaps the turning post took Scorpus. His chariot, his horses and he were mauled and trampled to death as the other chariots and horses, coming headlong into him, tried to navigate around him. 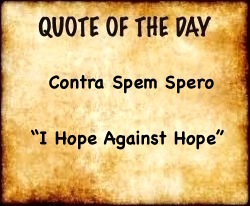 It is sure Scorpus knew/had seen that scene often during his thousands of races and his 2,048 victories. Young Scorpus had had it all. Until…. 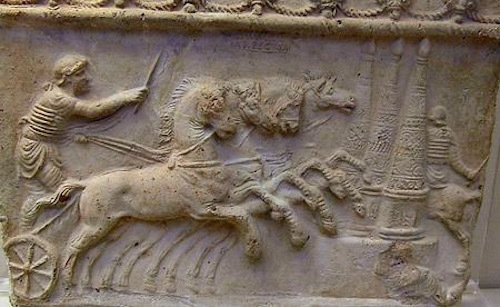 CLICK HERE for article on Roman chariot race horses.